The first butterfly I see in spring is the mourning cloak, Nymphalis antiopa. The species ranges throughout the northern hemisphere, and is called mourning cloak in many other languages, though in Britain it’s called Camberwell beauty, white petticoat, or grand surprise. It gets a jump on other species because it doesn’t migrate long distances, instead overwintering in suitable habitat tucked into tree cavities or under loose bark, emerging in early spring to begin its reproductive cycle. After mating, females lay their eggs around twigs of host trees upon which their caterpillars feed, including various species of willow, cottonwood and birch, and in American elm, hackberries, wild rose, and poplars among others. The slightly worn wings of the mourning cloak above attest to his long life, having metamorphosed mid-summer last year and overwintered nearby (maybe in my birch tree, or wild rose). This week he is out searching for females, and after breeding he will live only another month or two. Sources say mourning cloak adults prefer to feed on tree sap and decaying fruit and rarely flower nectar, though I always see them in the flowering fruit trees. Not in the compost pile! In my quest for bumblebees, I’ve been grudgingly rewarded this week. I caught one a few times in the mystery tree, saw one last night on the Nepeta in the south border, and this morning one in the peach tree. Frequency of sightings is increasing, though I still think there should be many more by now than I’m seeing. This week in sunflowers… and other yellow things. Diverse native bees, including the sunflower bee (Svastra, I think: the males have unusually long antennae) are buzzing and feeding in the sunflowers, and a few goldfinches have come for seeds but fly too fast from me when I come out with the camera. Grasshoppers continue to maraud every living plant, including the gladioli, giving me a window into a bud. Dahlias are suffering worse than glads from grasshopper predation, though these later blooms are in better shape than those in early summer; enough flower left to provide for this bumblebee. Bumblebees are so complicated, with any one species having so much variety in parts and patterns, queens and workers and males all different sizes with different color sternites, tergites, and corbicular fringes, variable leg part sizes and cheek ratios… It would take more time and focus than I have now to even try to learn them. 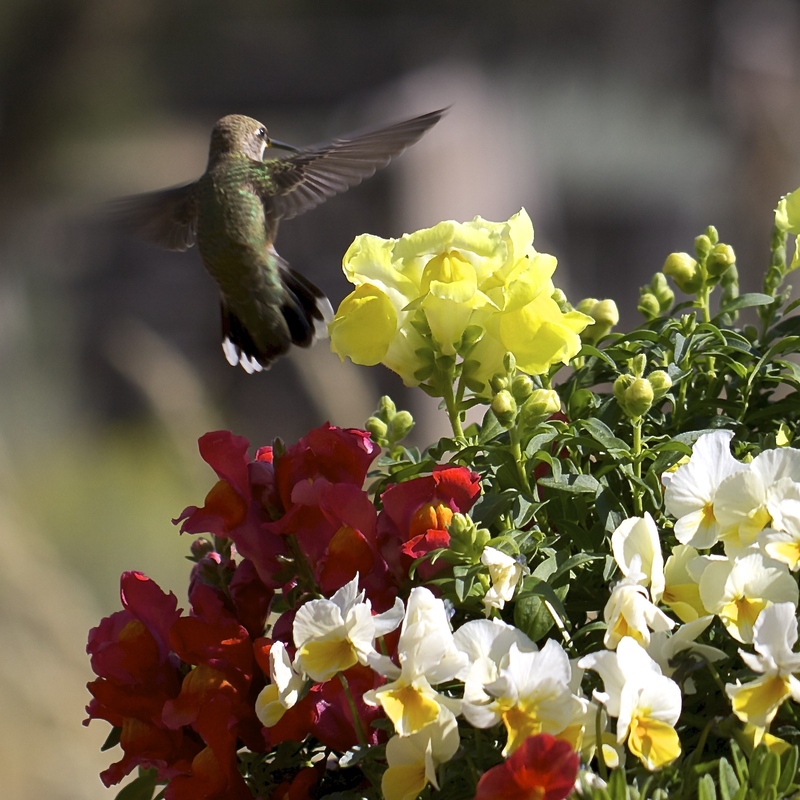 We have about 13 species in this part of Colorado. But I can’t even remember that many. One, two, or possibly three more species below, on Prince’s Plume, mullein, and Rocky Mountain beeplant respectively. Meanwhile, the fernbush, Chamaebateria, has also been blooming, attracting more flies than bees, and a few butterflies as well, including this Painted Lady. But who will this adorable, soft creature turn into one day? I rescued it from porch sweepings, and dropped it into some leaf litter, but not before examining it on my breakfast plate. Its antennae surprised me, popping out when I scared it, then sucking back into the top of its round face. Here, they’re halfway back in, after shooting straight out in alarm. Dragonfly perched on a radish seedpod. Those horrible thunks against the window… I heard one on the west kitchen window last week and saw the body drop. Dashed outside, around the Foresteria loosing masses of purple berries to the ground, beyond the woodpile, and tiptoed through the mess of palettes, hoses, wire cages, and empty pots to find this young yellow warbler out cold on the ground. I carried him around to the south side of the house looking for a good shady perch, and set him in a sturdy crook in the apricot tree. Brought the cats inside and left him there for awhile. When I went back he had flown, so that was one good deed for that day. Then, just this afternoon, another smack into the east window. 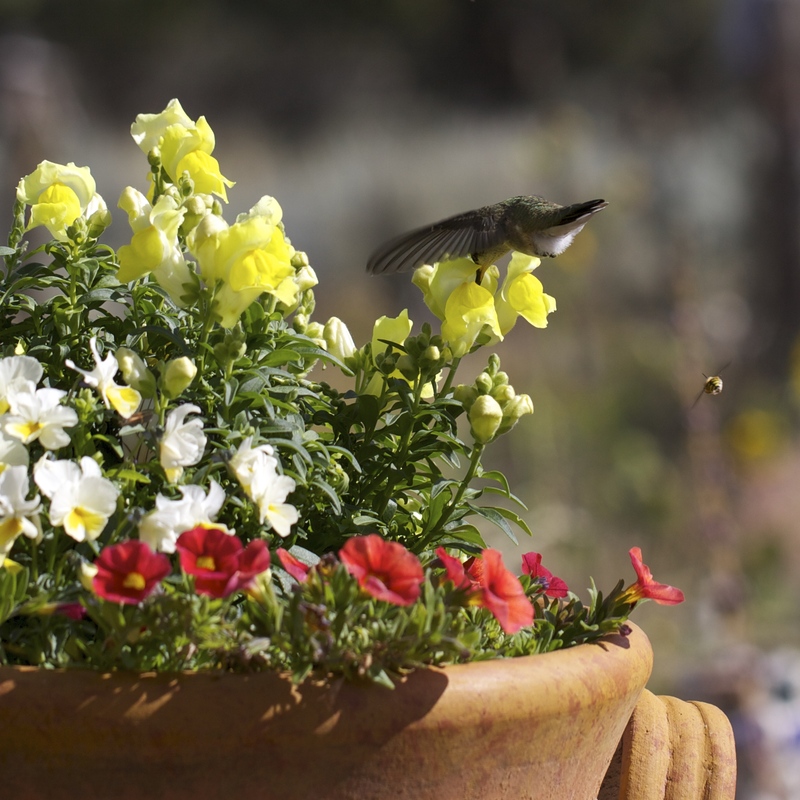 Outside, a tiny hummingbird facedown in a geranium pot. Its beak was a little askew. In my hand it was weightless, but its minuscule heart pounded. 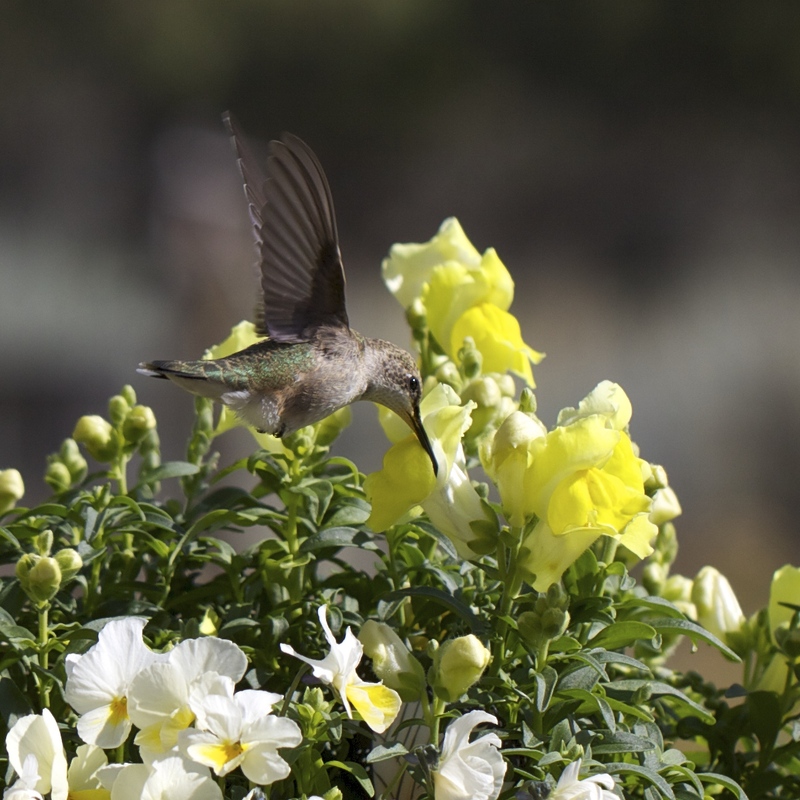 Cats secured inside, I set the hummingbird in a shoebox in the shade, putting a twig under its barely perceptible toes, and set a small bowl of water in front of it as it wobbled on its perch. I shut the lid for awhile, then checked, and tipped the water bowl so it could reach without moving. It flicked its threadlike tongue into the water. 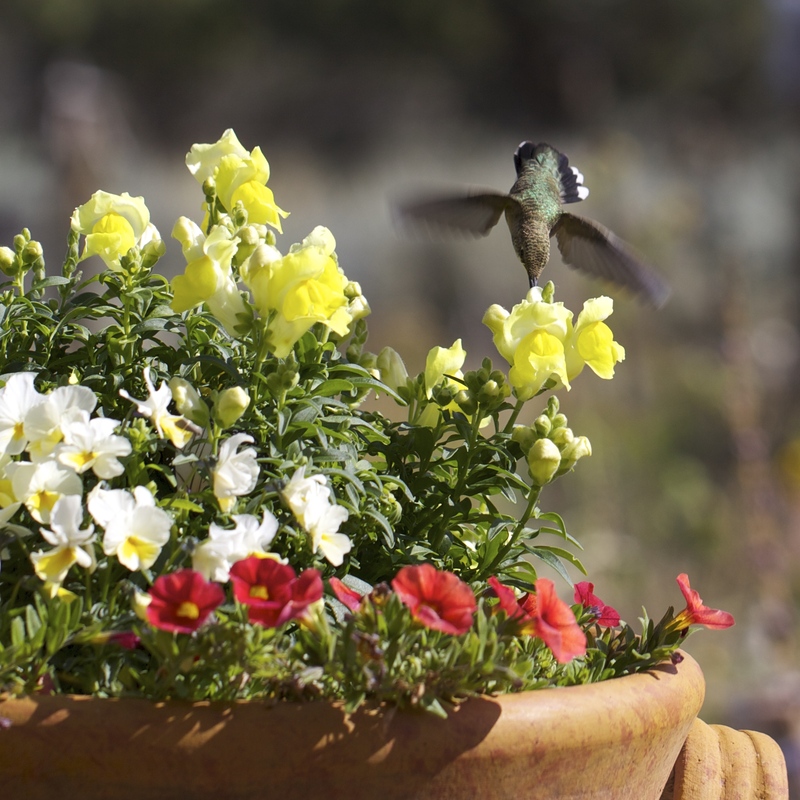 I dumped the water and filled the bowl with nectar, and it drank again from the tipped bowl. I shut the lid for another ten minutes; checked again, tipped again, left again. The fact that it was still alive encouraged me, though I was distressed it didn’t fly right off. Half an hour later I returned and opened the lid, tipped the bowl for another drink. I left the lid open and checked again in another half hour, dismayed to see the bird still there. But as I moved toward the bowl, the little bird cocked its little pea-head then zipped out of the box, up and out of sight! Sometimes all they need is a safe space for long enough to get their head on straight. Not long after that, I caught a goldfinch in the sunflowers. 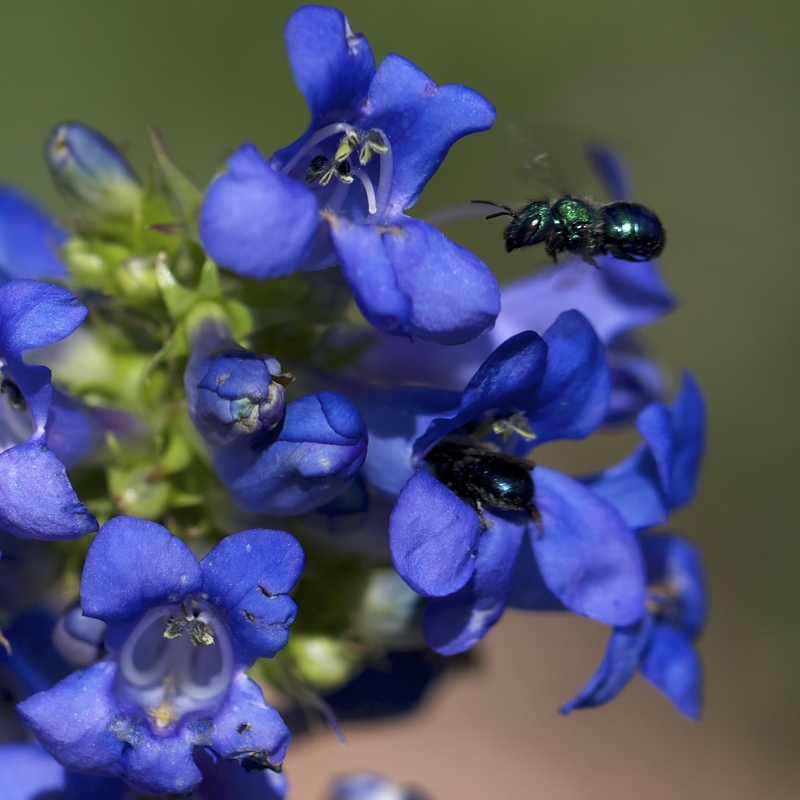 Two native Osmia, or orchard bees, enjoying the cerulean blooms of Penstemon cyananthus. 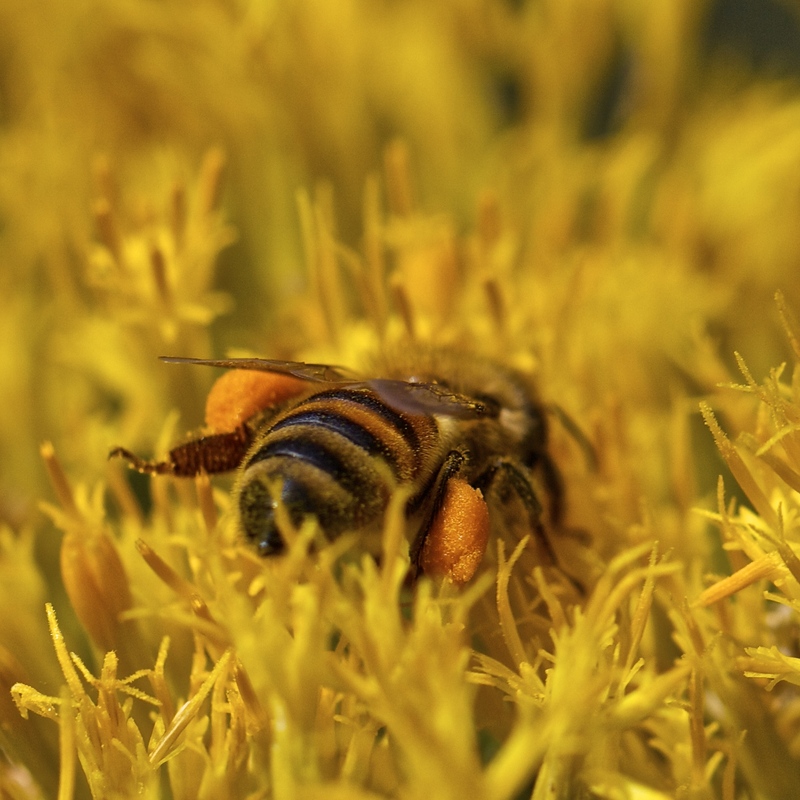 The demise of my honeybees has spawned a silver lining after all: It’s opened my eyes to the wider world of native bees. The first summer with my captured swarm of “wild” honeybees, I bought a macro lens specifically to photograph them; I also bought a special pair of binoculars, Pentax Papilio, the only binoculars I could find after hours of online research with a focal length short enough that I could sit close to the hive and watch the bees go in and out. It’s not the best for watching faraway birds, but turned out to be amazing for getting a better view of things that are already pretty close up. When my close-up vision began to deteriorate about fifteen years ago, I just let go of the need to see small things without my glasses. Consequently, I missed a lot of what was going on in the garden. Aphids, for example, until they had already done a lot of damage to a plant. 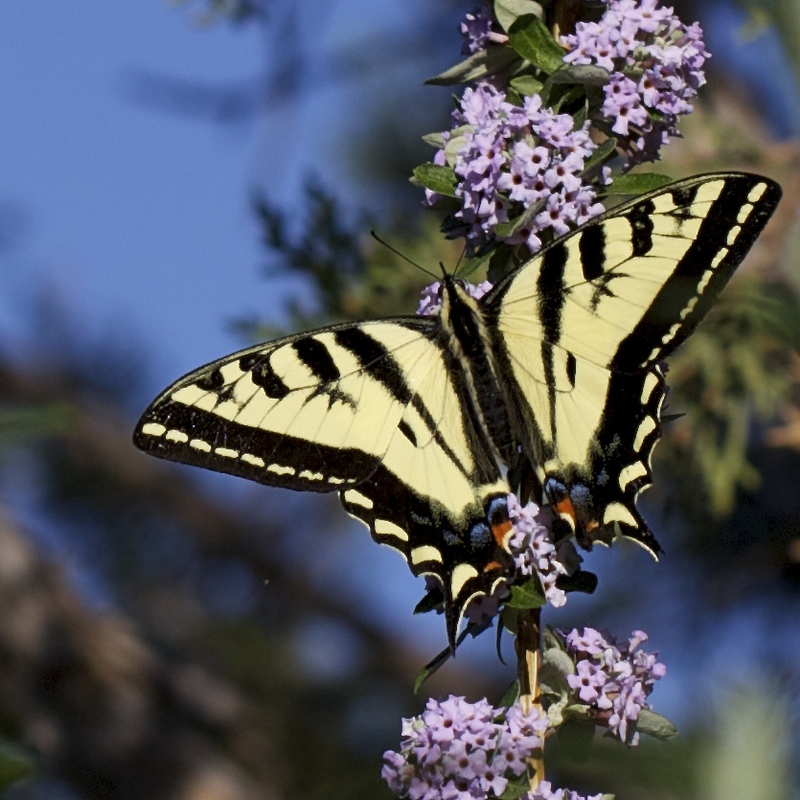 But with the Papilios and the new camera lens, the world of small things opened up to me, and I was thrilled with it. 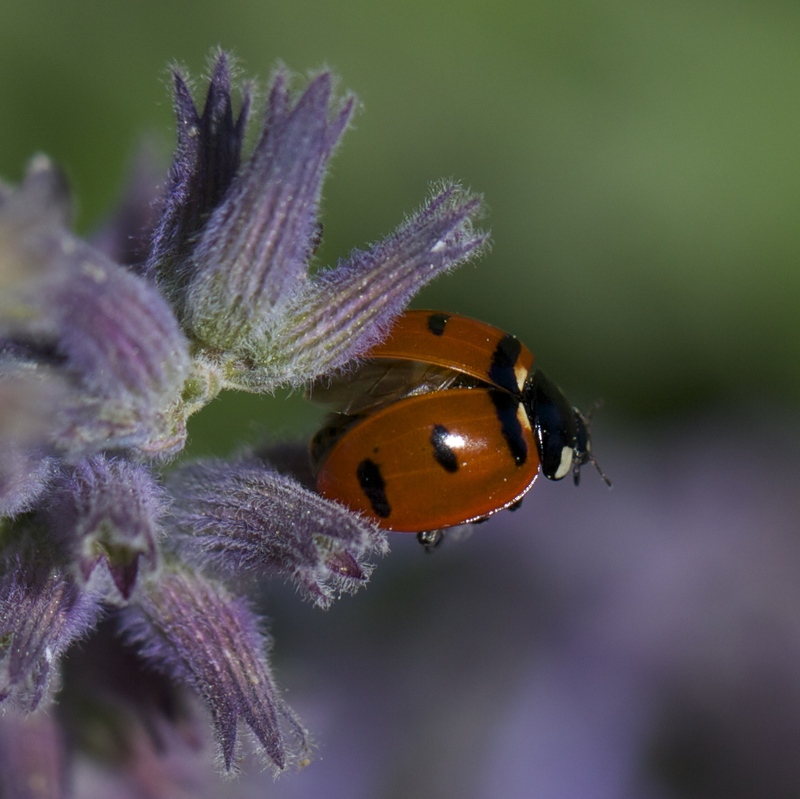 A ladybug taking off from the aging blossoms of catmint, Nepeta. 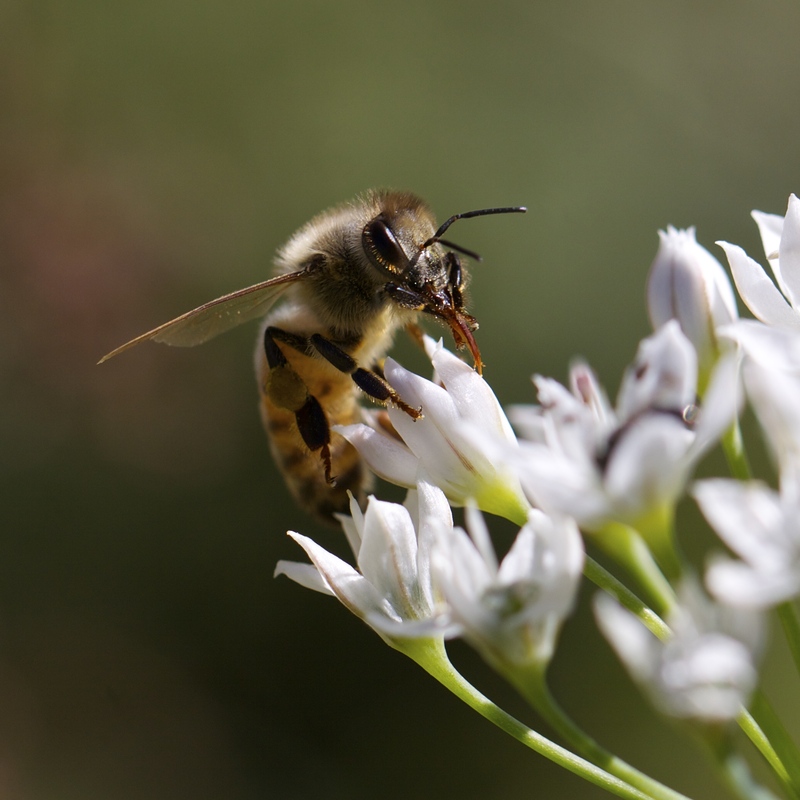 As I photographed my honeybees on all the various flowers in my drought-tolerant landscape, I found myself taking pictures of other small creatures in the same blooms, some of them really quite minuscule. Smaller than gnats, even. 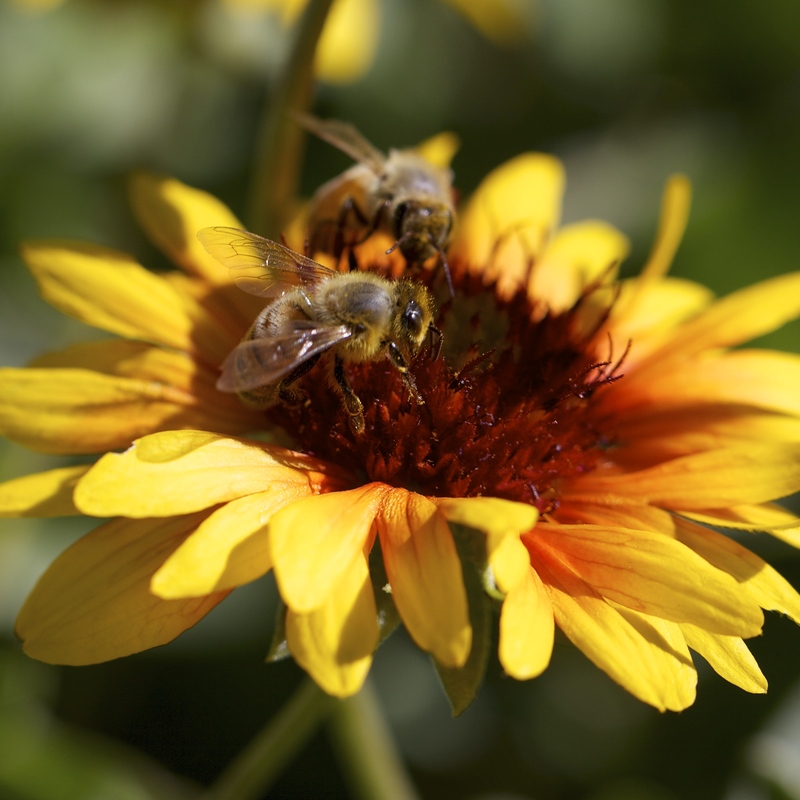 I remember when Joseph came over to help me open the hive that first time, he looked at some flowers abuzz with bees and said, “Oh, nice, native bees.” It registered, but I didn’t understand it. How could he tell from where he stood what kind of bee was moving around just inches above the ground? But about a decade ago, because I’m fundamentally lazy (though curiously driven at times) I decided that I no longer need to know the names of things; it’s enough that they are here, living, and that I witness their glory, each and every unique living thing I come across. 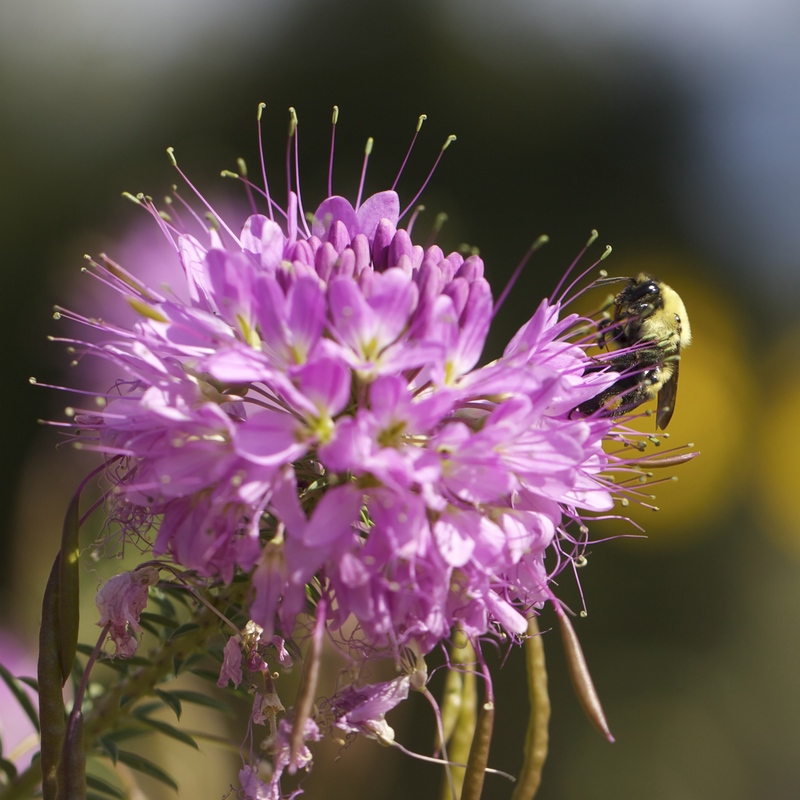 So I haven’t spent any time the past three winters learning the names of all the native bees I’ve photographed. Because something else is always above that on my To-Do List. A native bumblebee (Bombus) in the small blue penstemons that grow between flagstones. 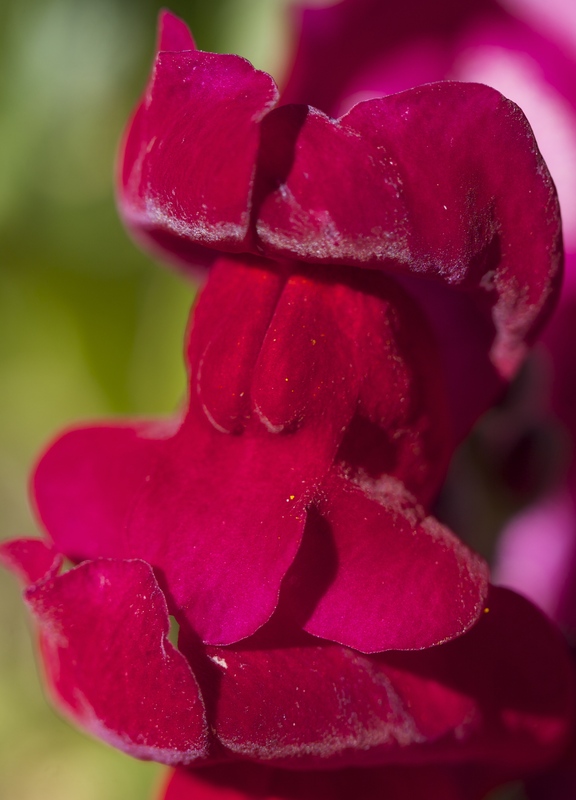 The proper names of all the penstemons in the garden? Another story. 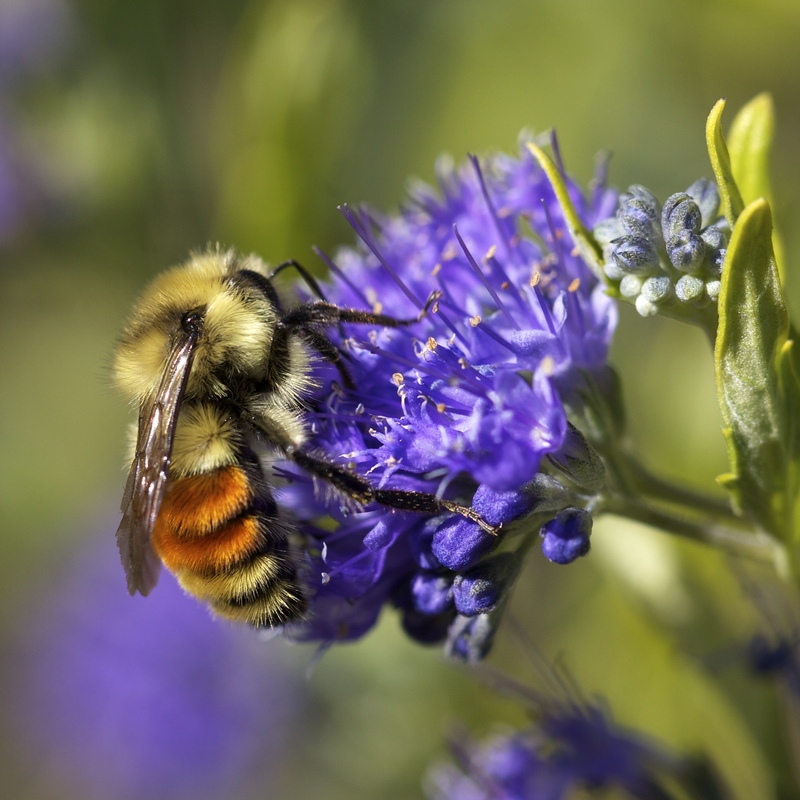 And it turns out it’s not so easy to ID bumblebees down to species. 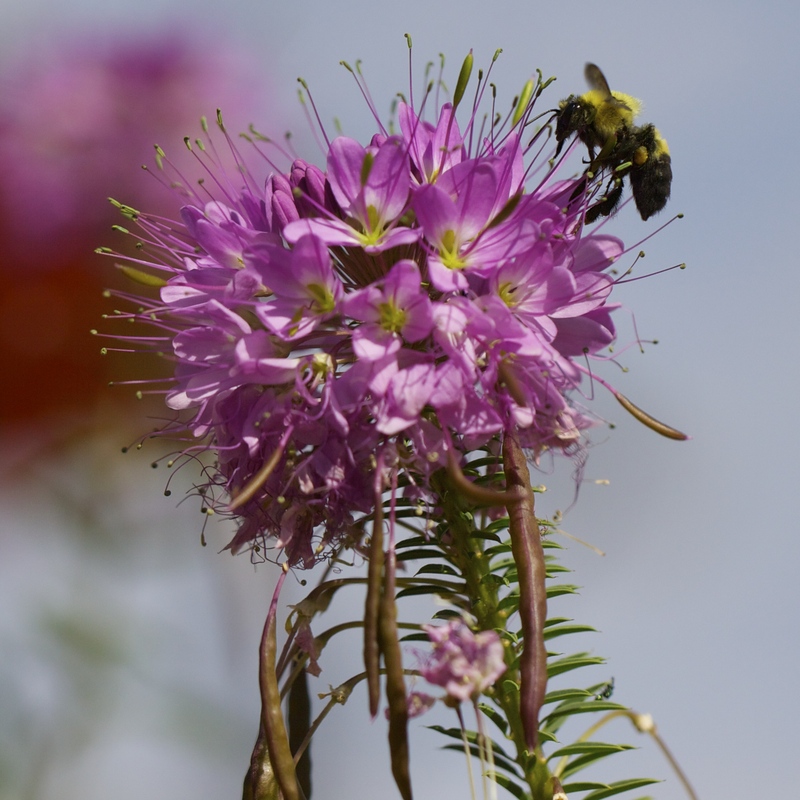 Chris sent me an email last spring announcing a national Pollinator Photo Contest, and so I entered some of my images. 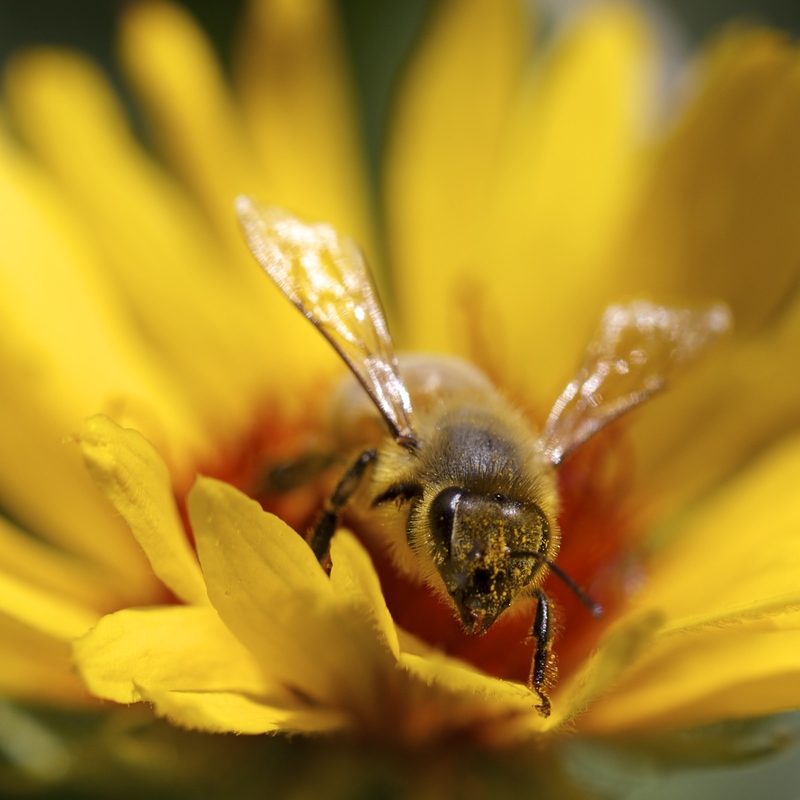 There were actually two contests, one sponsored by the Center for Food Safety, and the other by the Wild Bee Gardens app. I was pleased to learn that I won in both contests, with different images of a native leafcutter bee, Megachile sp. So there is half of the proper name that I have learned. The app creator also wanted to use some of the other images I submitted in the new version of the app, so I happily consented to that. And then I checked out the app. It is elegant, and brilliant. And the introductory video changed my life. 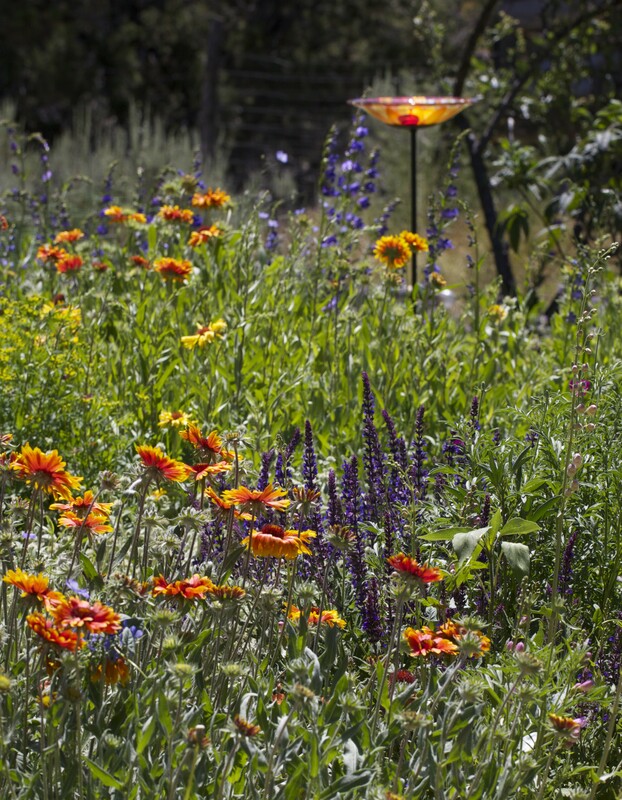 Gallardia, Salvia, and Penstemon with the new birdbath, a gift. 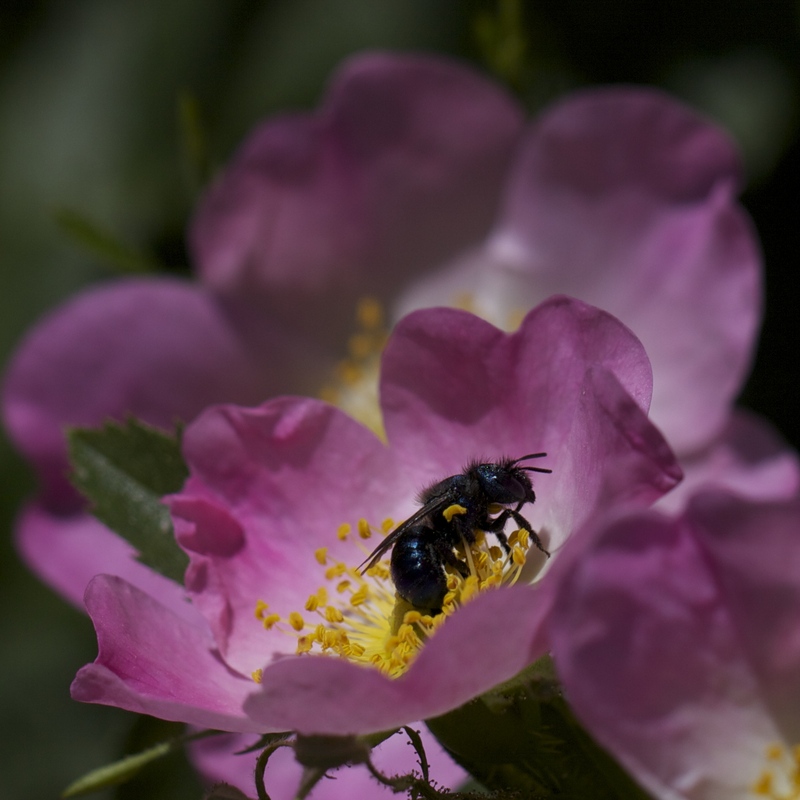 Wild rose, Rosa woodsii, blooms profusely, hosting many species of pollinators during its short bloom cycle. 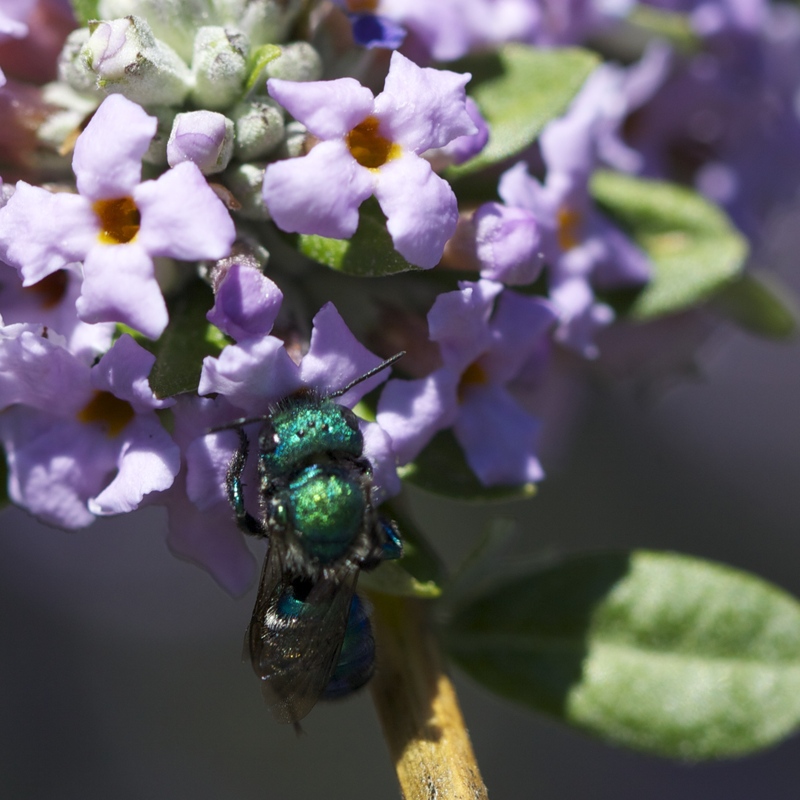 Yet another Osmia on the wild ancestor of the common butterfly bush, Buddleia alternifolia. 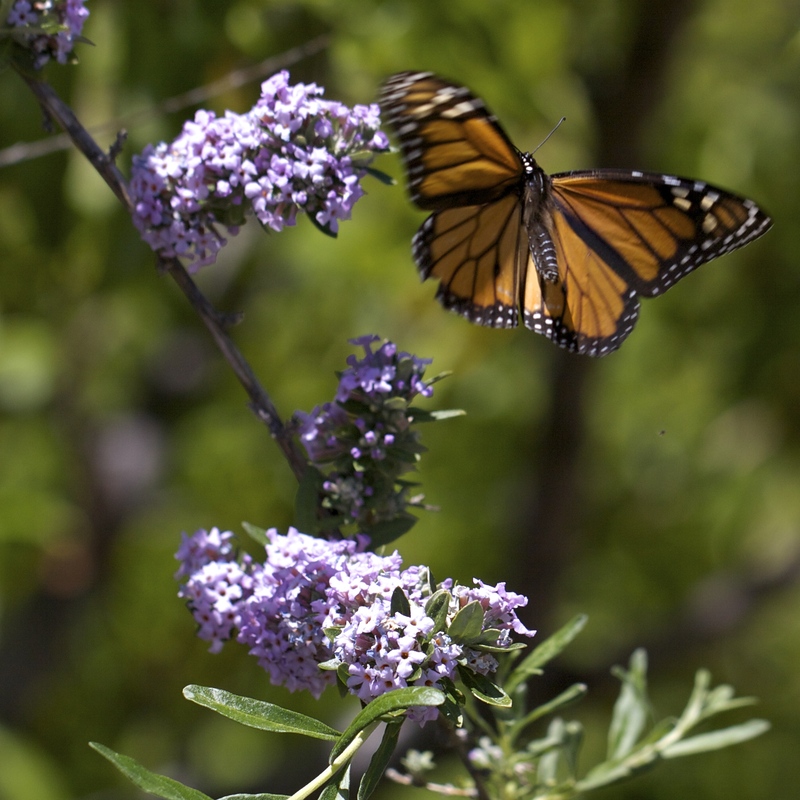 … and this elusive Monarch. Last year my entire yard was loud with the sounds of bees, especially honey; now it buzzes discretely with the wingbeats of native bees. And my eyes are opened. 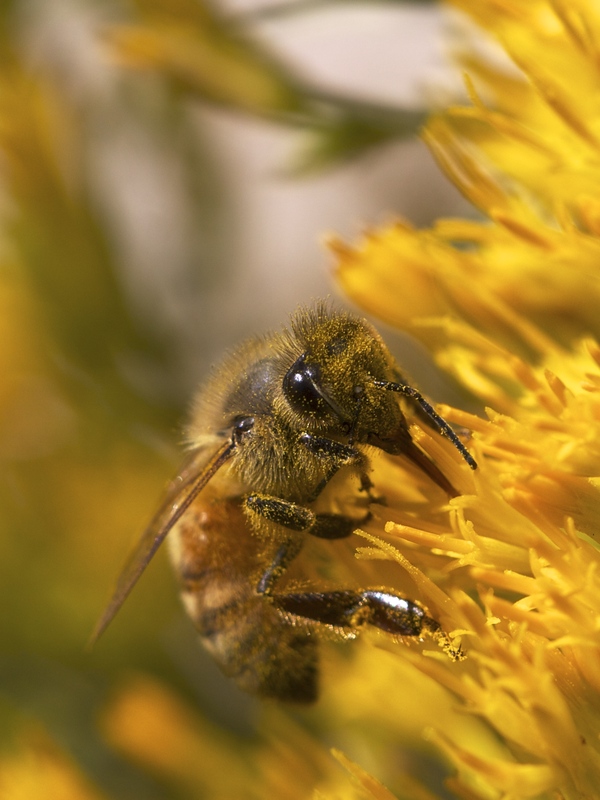 I learned from the app that there are around 4000 species of native bees in North America, and they are responsible for pollinating far more of our native and staple food plants than are the introduced honeybees. 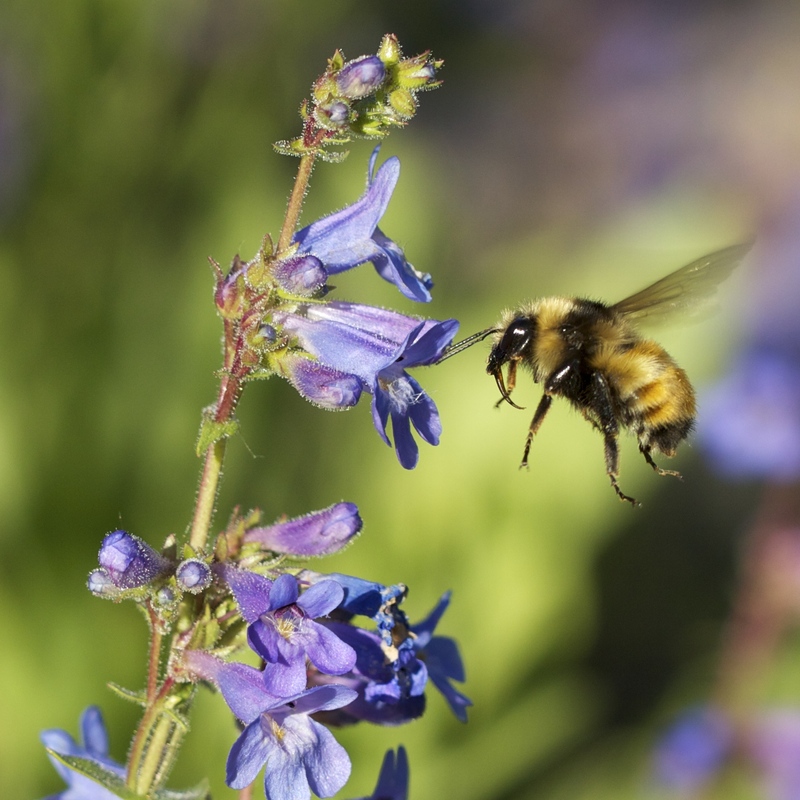 For example, blueberries, green peppers, and tomatoes are best pollinated by bumblebees. 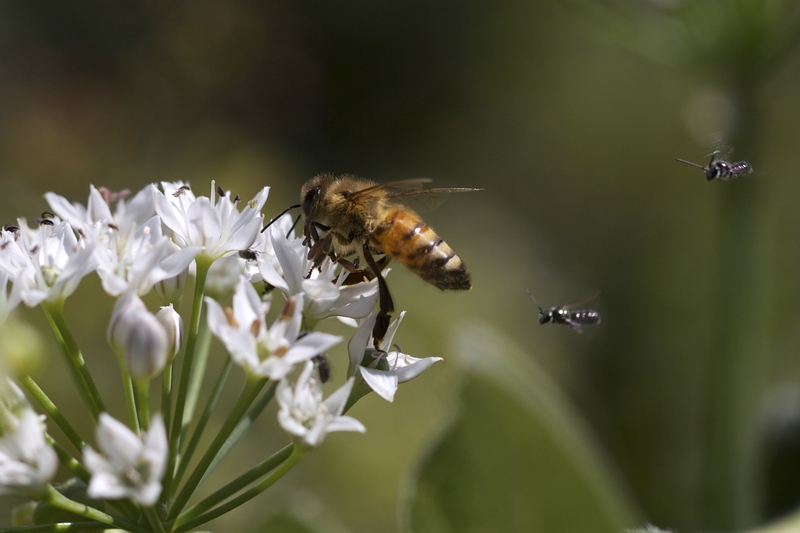 Fortunately, someone else did, and she pursued the question to its natural conclusion: a digital field guide to the native bees of North America. 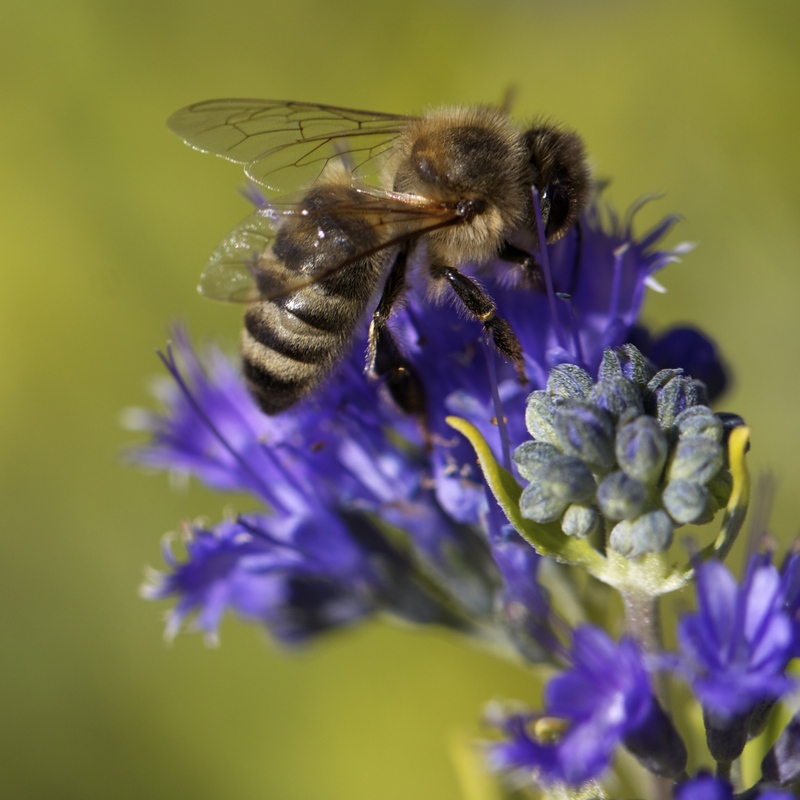 Celeste Ets-Hokin, an Oakland biologist, conceived and created the Wild Bee Gardens app, an elegant and intuitive research tool for gardeners, farmers, and others interested in preserving pollinators. 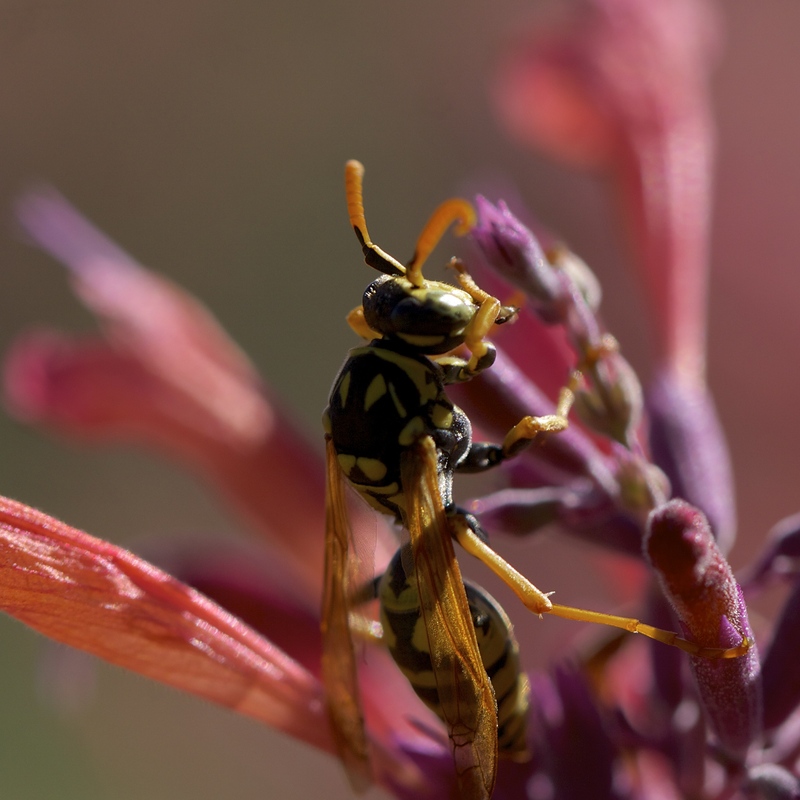 With cross-references among native bee genera and the plants that host them, fabulous native bee photographs (including, in the newest version coming soon, some of mine), and extensive written guides on their ecology, lifecycles, anatomy, behavior, and how to create a wild bee garden, the app is a wealth of information, a whole college course in one package, and an inspiring creative work. It’s holding my feet to the fire, and making it fun, once again, to learn the names of things. Not quite last, this very tired young hummingbird roosted on a broken sunflower stalk a couple of inches above the ground for hours on October 2nd. 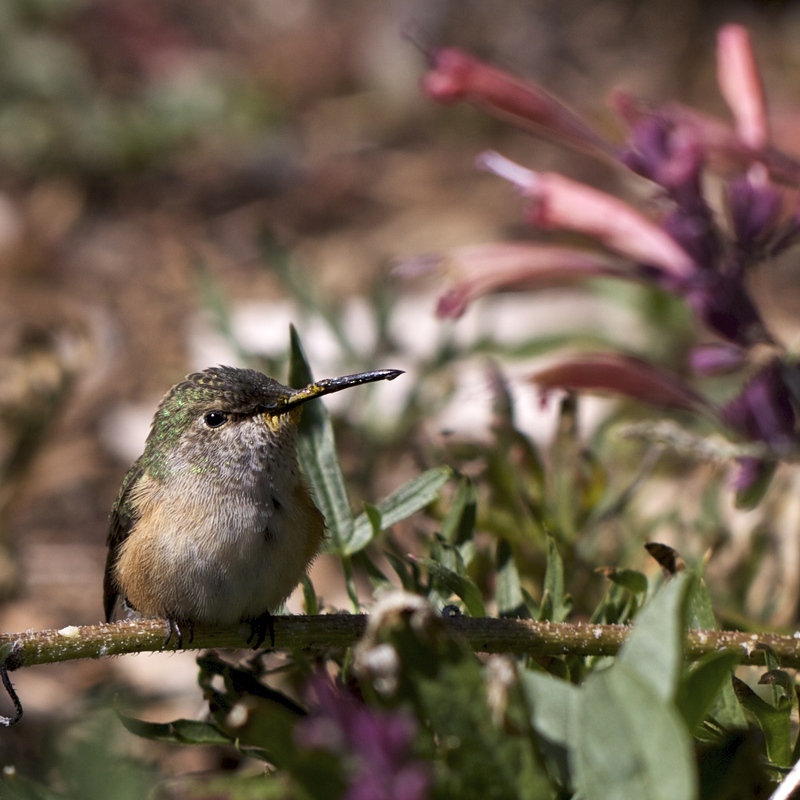 Intermittently he’d fly up and drink some nectar from the bountiful hummingbird mint, Agastache, that seemed to be a godsend for a lot of late birds. It’s still blooming! I’ve seen two more since this one, the latest last Wednesday, October 8th: a record in my 14 years taking note. 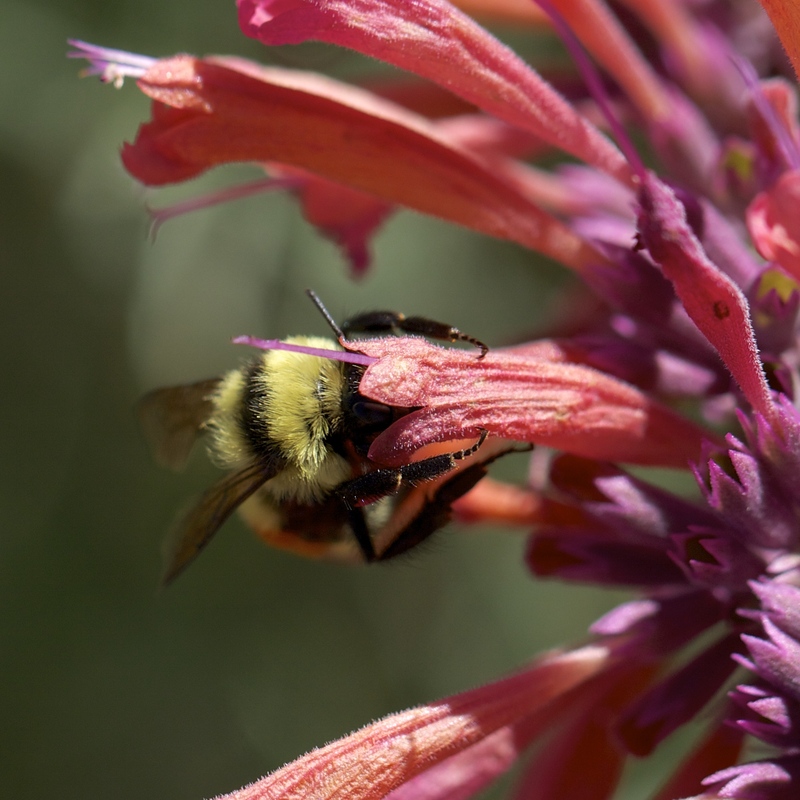 Not only the hummingbirds but bumblebees and wasps are enjoying the long-lasting blossoms of this licorice-scented Agastache. 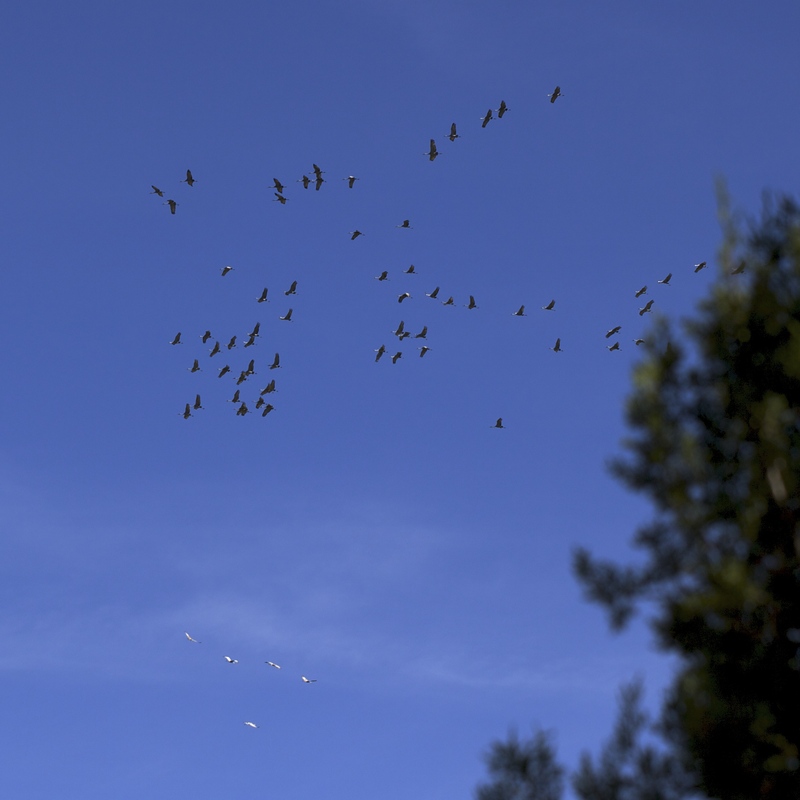 Sandhill cranes spiral and soar overhead on their raucous way south. 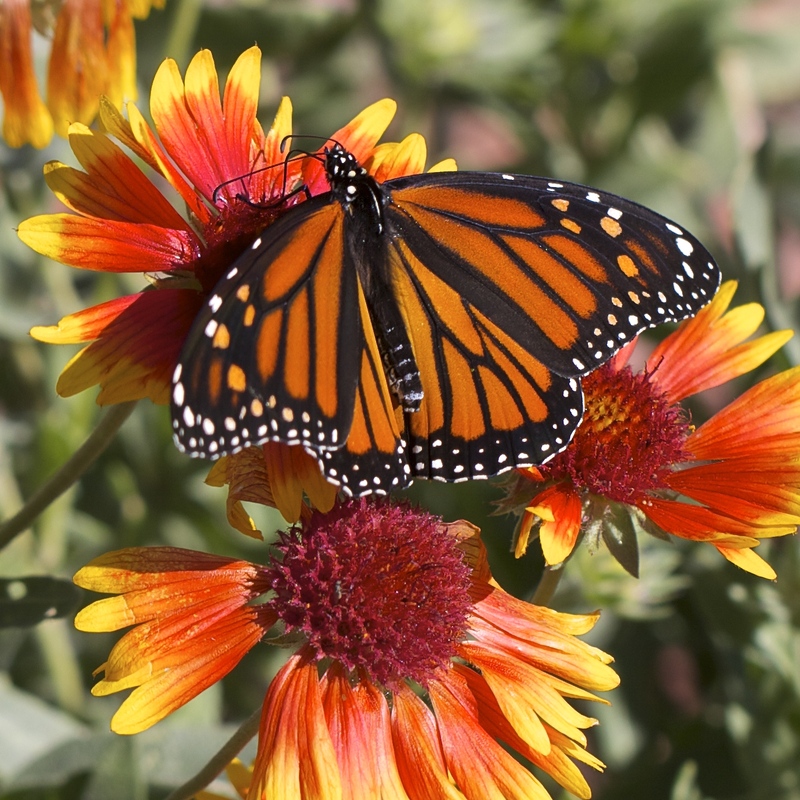 A lone monarch was lucky to find some nectar left in late-blooming Gallardia. 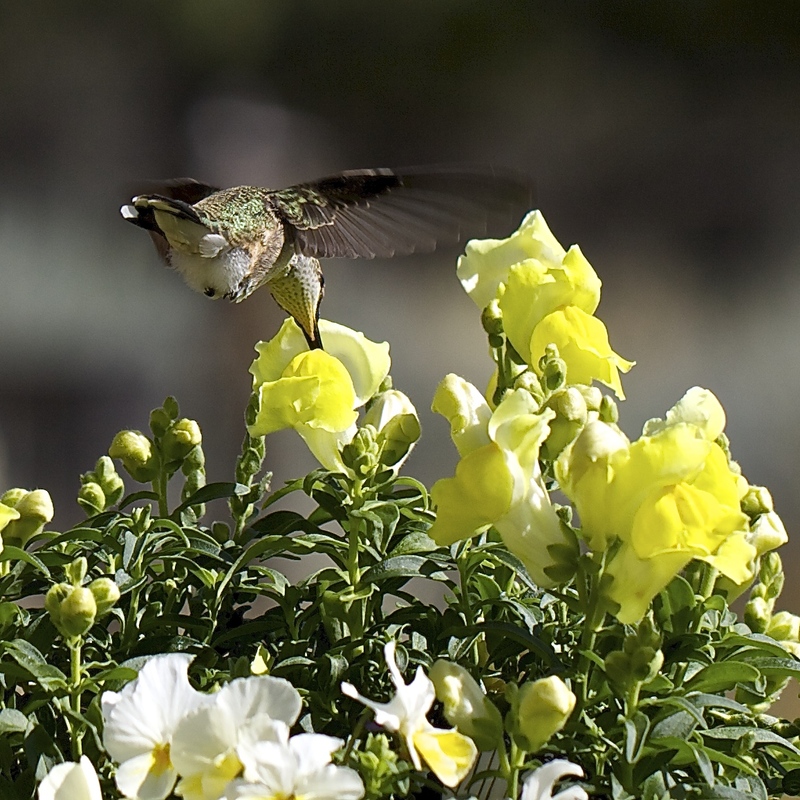 Snapdragons still blooming profusely are also providing late nectar for hummingbirds and bees, their colors and velvety texture keeping some hot spots in the garden’s yellowing autumn palette. 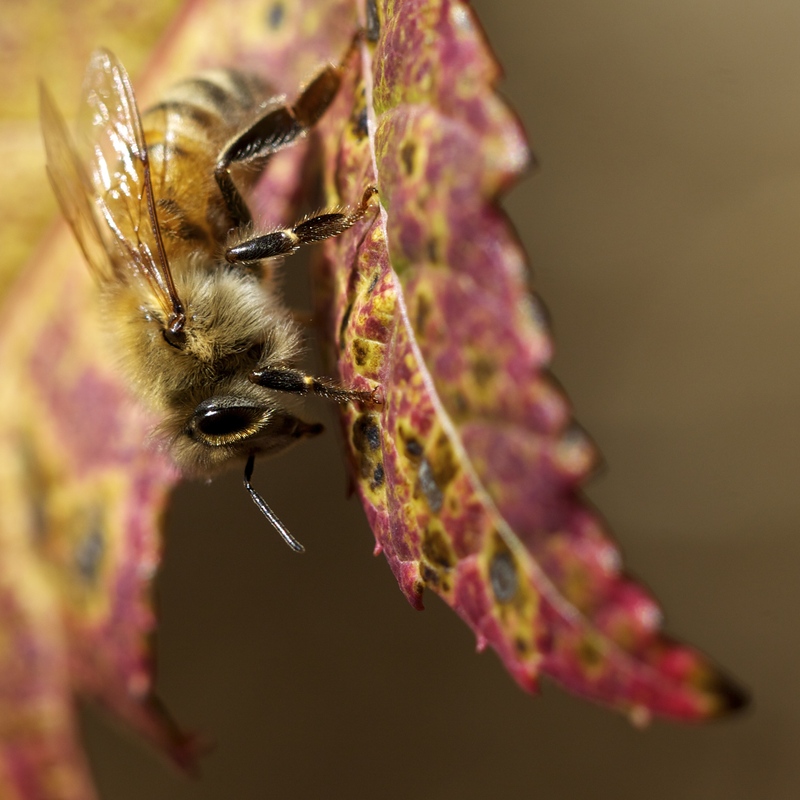 A honeybee seeking something along the turning leaf of the Amur maple beside the hive. Preparing for a show in spring, we’re naming all the bees again. This one is Saddlebags. 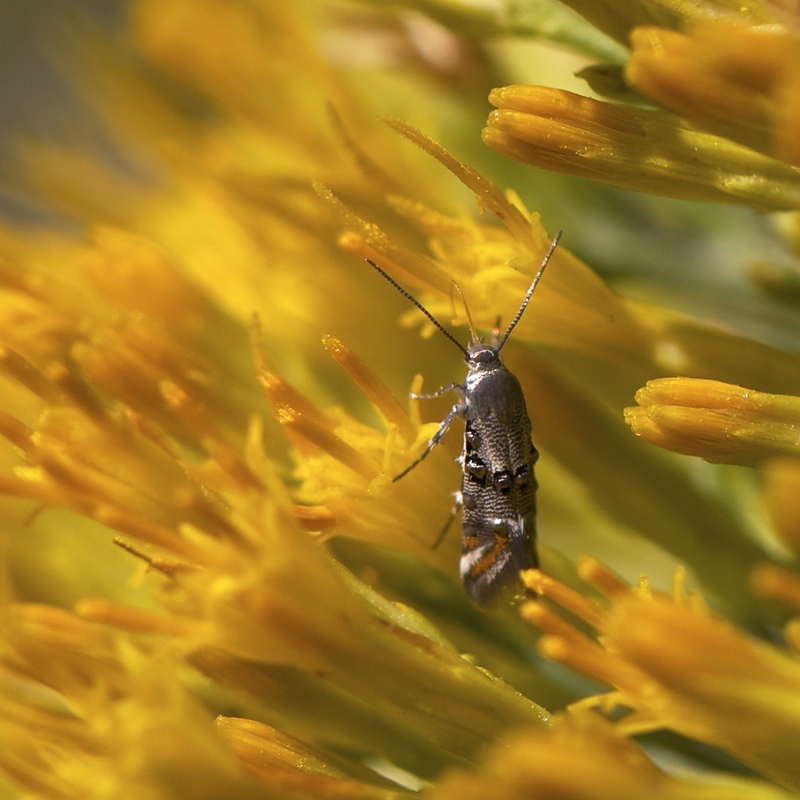 …and in photographing bees, I found this tiny little creature which appears to belong to a group called Micromoths. 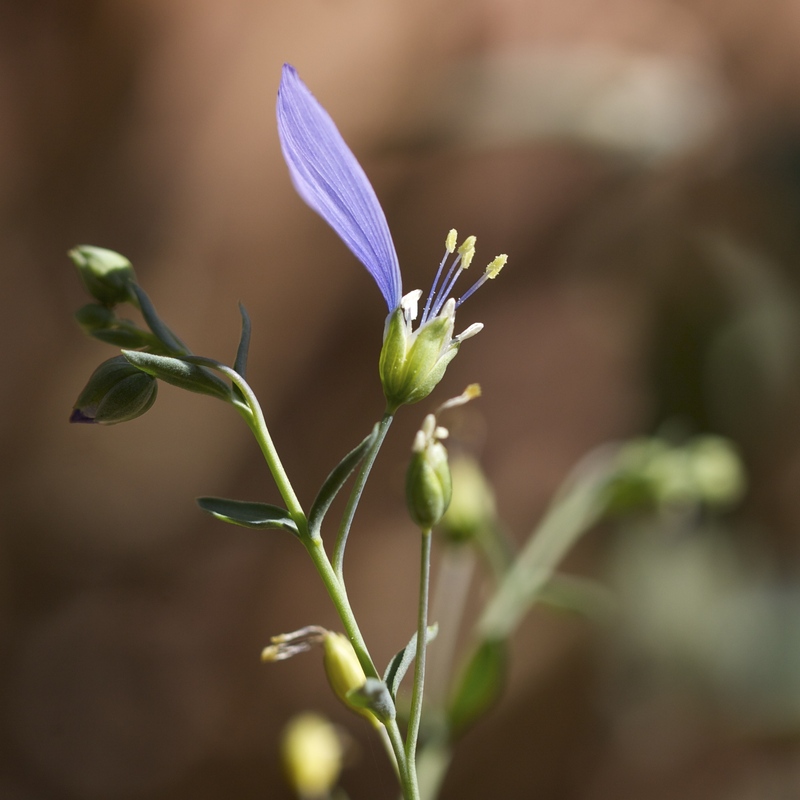 A honeybee hovered at a single late flax flower at my feet; I ran in to get the camera. 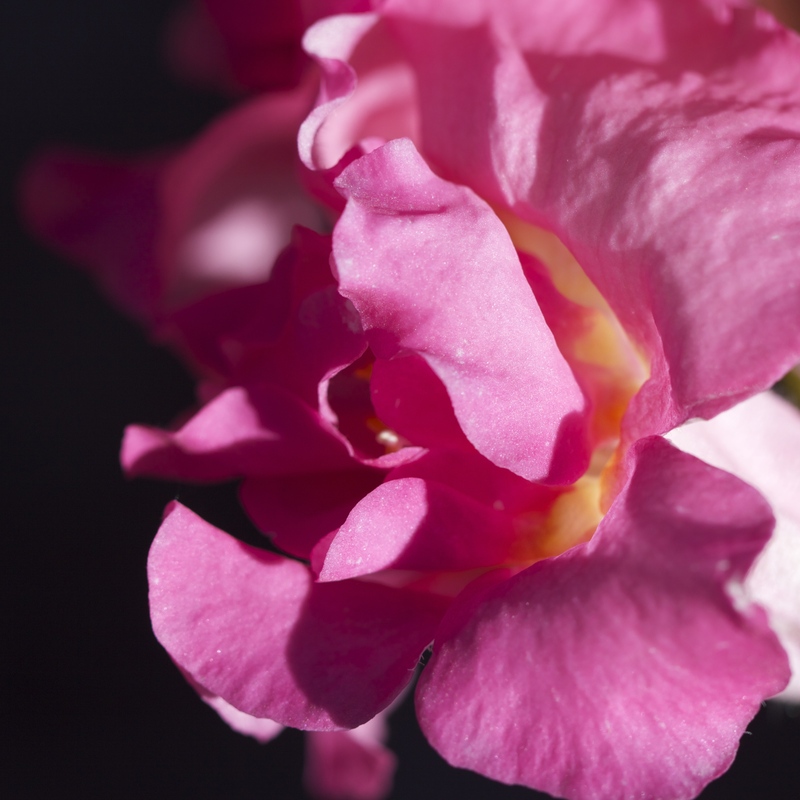 In that one minute, the bee flew and its breeze blew four petals off the bloom. 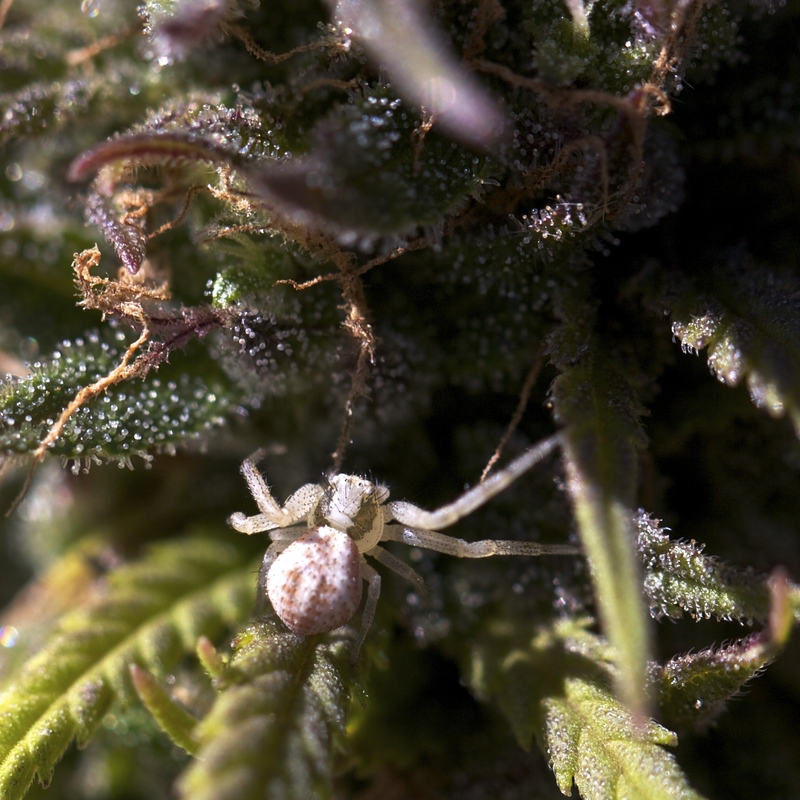 Checking on the medicinal herb I found this tiny white spider. 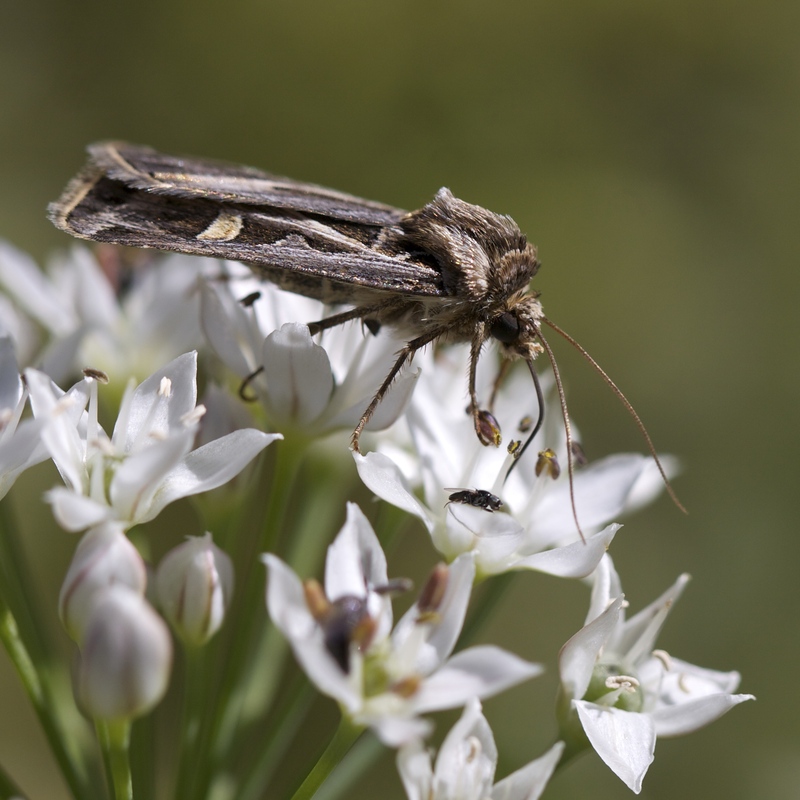 …and also appealing to a few moths.